The 70th annual Technology & Engineering Emmy® Awards were presented at NAB earlier this week. Four companies received awards for “Cost Effective Crowd Simulation Tools”: Golaem (team pictured above), SideFX, Massive, and Basefount. Here at fxphd, we have courses covering software from three of those companies. “Since its first release in 2011, Golaem has allowed more than 300 VFX and Animation studios of all sizes, from freelancers to over 1000 employees, to populate more than 600 projects of all ranges, from low budget commercials to large budgets feature motion pictures. We are thrilled to receive this award, and grateful to the The National Academy of Television Arts & Sciences for its recognition.” said Stéphane Donikian, Golaem CEO. 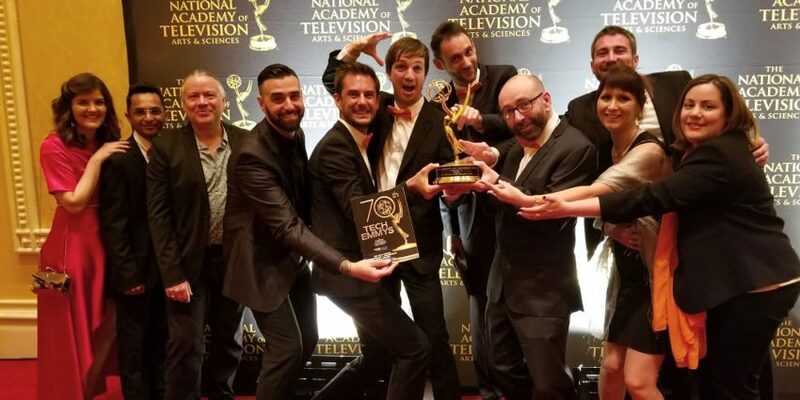 “The Technology & Engineering Emmy Award was the first Emmy Award issued in 1949 and it laid the groundwork for all the other Emmys to come,” said Adam Sharp, President & CEO, NATAS.